Our members play a valuable role in influencing and supporting the work of Shared Dreams. 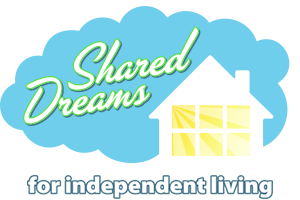 It is important that our membership includes all individuals and families who have a vested interest in the work of Shared Dreams for Independent Living. In becoming a member, you are assuring you will sustain the beliefs, values and vision of our founding families. Shared Dreams for independent Living Members emulate our Vision by respecting that, all people who live with physical and/or intellectual disabilities, and, in particular, the residents of Shared Dreams, are recognized as the authority over their own lives, and enjoy supportive, person-centered, family-directed and -driven, permanent, sustainable homes in their own community.